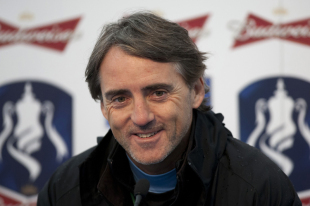 Roberto Mancini has claimed his former club Manchester City are “still a bit behind the big European clubs” in terms of status and quality. With Manuel Pellegrini set to start his new job as City manager in the coming days, Mancini has suggested the Chilean may struggle to improve on the record he had as the club’s manager before he was sacked in May. “I would say City are a bit like Juventus. They are growing but are still a bit behind the big European clubs,” he said, according to The Sun. “To win the Champions League you need experience and the right squad. There aren’t many games, so if you get two wrong then you’re out of the running. Mancini went on to dismiss the notion that German football is now the dominant force in the Champions League, even though last season’s Wembley final was contested between the country’s top two sides. “I do not agree with those who say German or even English clubs are dominant in Europe,” he added. “The Germans have the benefit of a long winter break, while the English lose intensity as time goes on because they never stop playing.